Below is the full text of the document signed by President Trump and Kim Jong-un, the North Korean leader. President Trump and Chairman Kim Jong-un conducted a comprehensive, in-depth, and sincere exchange of opinions on the issues related to the establishment of new U.S.-DPRK relations and the building of a lasting and robust peace regime on the Korean Peninsula. President Trump committed to provide security guarantees to the DPRK and Chairman Kim Jong-un reaffirmed his firm and unwavering commitment to complete denuclearization of the Korean Peninsula. Convinced that the establishment of new U.S.-DPRK relations will contribute to the peace and prosperity of the Korean Peninsula and of the world, and recognizing that mutual confidence building can promote the denuclearization of the Korean Peninsula, President Trump and Chairman Kim Jong-un state the following. 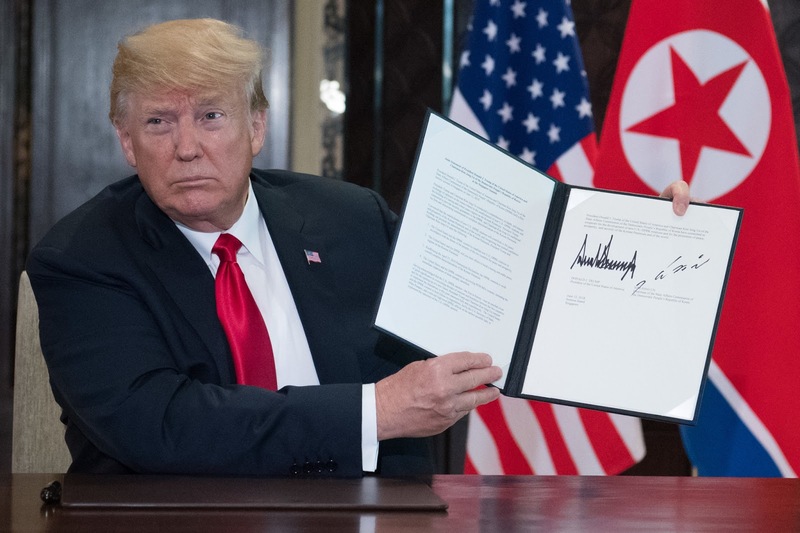 Having acknowledged that the U.S.-DPRK summit — the first in history — was an epochal event of great significance in overcoming decades of tensions and hostilities between the two countries and for the opening up of a new future, President Trump and Chairman Kim Jong-un commit to implement the stipulations in this joint statement fully and expeditiously. The United States and the DPRK commit to hold follow-on negotiations, led by the U.S. Secretary of State Mike Pompeo, and a relevant high-level DPRK official, at the earliest possible date, to implement the outcomes of the U.S.-DPRK summit. President Donald J. Trump of the United States and Chairman Kim Jong-un of the State Affairs Commission of the Democratic People’s Republic of Korea have committed to cooperate for the development of new U.S.-DPRK relations and for the promotion of peace, prosperity, and security of the Korean Peninsula and of the world. I still hate Trump but I have to give him kudos for not screwing this up.